On a spring day in 1911, Dard Hunter wandered into the London Science museum and saw the hand papermaking and type-founding exhibits. The equipment for these crafts – papermaking moulds, watermarks, steel punches, copper matrices, and hand-held typecasting moulds – inspired Hunter to learn more about these centuries-old crafts. The British Museum Library provided Hunter with all the information he could have desired. For the first time, Hunter felt the fine papers – thin but strong – with beautifully textured surfaces. With every book examined Hunter amassed visual and tactile references that led him to a deep and abiding appreciation for the important role paper played in books. Hunter left London in 1911 with the primary goal of experimenting with paper and making type by hand. Within a few months, he purchased an historic house in Marlborough-on-Hudson, New York. 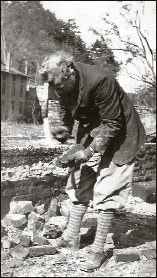 By 1913, he had built a mill on Jew’s Creek across the road from the house. He fashioned the mill after the half-timbered and thatched buildings he saw in the Cotswolds in 1911. 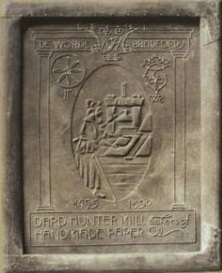 Not wanting to compromise his goal to manufacture paper using seventeenth century techniques, Hunter relied entirely upon a water wheel to provide power to the mill. He purchased papermaking moulds from England and began experimenting with watermarks. That first year, by varying the processing chemistry and beating times, Hunter soon had numerous types of paper. Word of the mill spread quickly, and as there were no others in America making paper by hand, Hunter was soon swamped with orders. However much he wanted to, he was unable to fill these orders because the water supply was much less than expected and unpredictable. During the winter months, work in the mill ceased and Hunter worked on his type. It was at Marlborough that Hunter would produce the world’s first one man book with the publication of The Etching of Figures in 1916 which was soon followed by The Etching of Contemporary Life in 1917. At this point, Hunter realized that his papermaking , type-founding, and printing operations had gone far beyond the experimental stage. Recognizing that the Marlborough mill would never succeed due to the lack of water power, Hunter sold the Mill House property in 1918. In 1919, the family moved to Chillicothe where Hunter purchased and renovated the impressive Mountain House, built in the early 1850’s. Hoping to establish another paper mill, Hunter returned to England in 1920 where he purchased and shipped home disused papermaking equipment. But before any concrete plans were made, he postponed this idea to concentrate on writing. The result was the publication of Old Papermaking in 1923, The Literature of Papermaking 1390-1800 in 1925, and Primitive Papermaking in 1927. 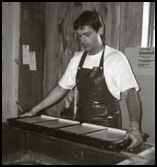 Between 1927 and 1932, the Mountain House Press was on hiatus while Hunter finally realized his dream and established a commercial hand papermaking mill in Lime Rock, Connecticut. In 1930 the first paper was made. Unfortunately, the mill did not thrive, due in part to the Great Depression, and it was sold at auction in late 1933. While in operation, the mill provided Hunter with enough handmade paper for many of his later limited edition books. While Hunter never again started another commercial paper mill, he spent the rest of his life pursuing the investigation of making paper by hand throughout the world and would share this knowledge through his books written on the subject. 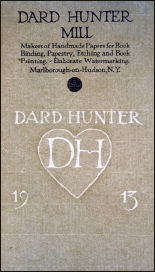 Beyond the significance of his books, one of Hunter’s greatest accomplishments was the establishment of the Dard Hunter Paper Museum. 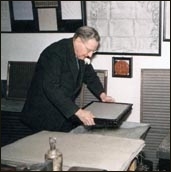 Originally housed at the Massachusetts Institute of Technology (1939-1954), it now comprises most of the collection of the Robert C. Williams American Museum of Papermaking located at the Institute of Paper Science and Technology in Atlanta, Georgia. Today, the Mountain House is home to a fully operational mill for making paper by hand. Our paper is used by artists and craftsmen around the country and many of the prints available from Dard Hunter Studios are printed on this paper.